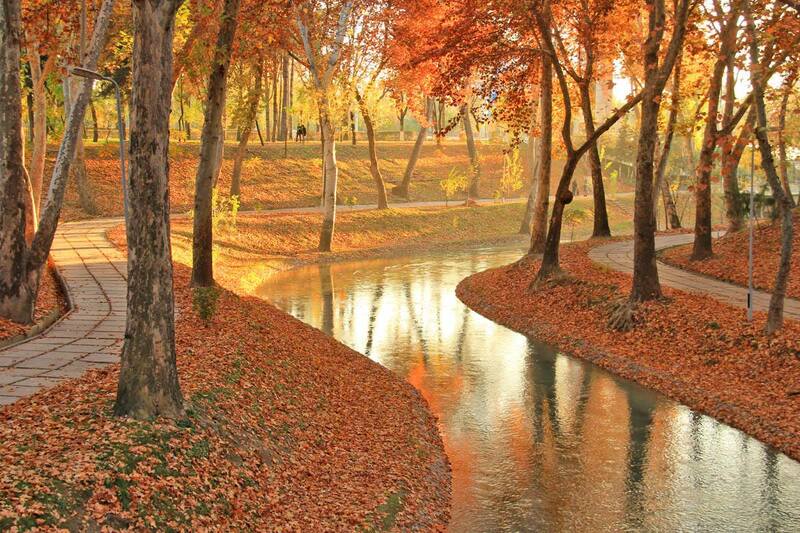 Strolling along the banks of the Anhor canal is a lovely way to relax in Tashkent, regardless of the season. Tashkent is situated at an elevation of 450 to 480 metres in the Chirchiq river valley, west of the Chatkal Mountains, and is intersected by a series of canals from that river. 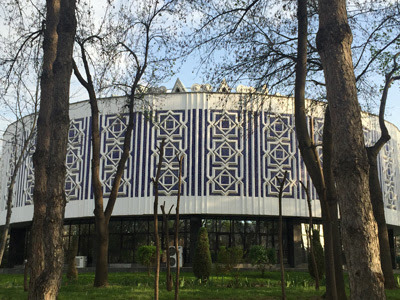 The beautification of the Anhor canal area in central Tashkent was triggered by the construction of Tashkent's newest, and largest, mosque - the Minor mosque, which opened in November 2014. Broad promenades were created and trees planted - given only a few years, they will form a shaded canopy on even the hottest August days. In the evenings, families stroll along the banks, children ride skateboards, lovers walk hand-in-hand and fishermen try their luck. An Uzbek version of Italy's passeggiata. Start your promenade by descending the stairs at the bridge near the Turkiston Palace concert hall, Alisher Navoi street, and turn right. Only a few metres later you will see the extraordinary outdoor summer concert hall - a marvel of Soviet architecture. 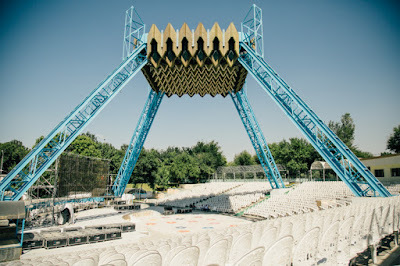 Performances are regularly held there in summer. Further along on your right, hidden behind dense trees, is another wonderful example of Soviet era architecture. Previously it was the Museum of People's Friendship; in 1996 it opened as the Museum of Olympic Glory, a one-of-a-kind museum in Central Asia. The goal of the museum is to organize exhibitions and events that show the achievements of national athletes in the Olympic Games and international competitions. The museum's collection counts more than 2000 exhibits, 1000 of which are permanent exhibitions. Here you can see medals, cups, prizes, stamps, coins and other items linked to the Olympic and Asian Games, World Championships and other prestigious competitions. The museum is open Monday - Saturday from 10:00 - 17:00, with a lunch break from 13:00 - 14:00. Near the museum is a cafe, overlooking the canal - ideal for a rest stop. Continue along the canal promenade, under the metro bridge, and soon you will see the domes of the new Minor mosque and Tashkent's TV tower. 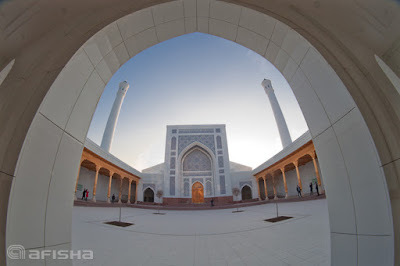 The largest mosque in Uzbekistan, Minor mosque is fabulous. Finished in white marble, it gleams under Tashkent's skies. With a capacity of around 2,400 worshippers, the mosque is divided into an open front section with terraces and a big round hall with a gold-plated mihrab adorned with writings from the Koran. Around the mosque are park-like gardens with plenty of seating. Now cross Amir Timur street , keep walking straight untl you reach Tashkent's TV tower, which started operating in 1985. At 365 metres, it is the tallest building in Central Asia. As well as transmitting radio and TV programs, the tower also serves as a complex hydro-meteorological station. The architects responsible, D Semashko and N Terziev-Tzarukova, were tasked with coming up with a design capable of withstanding earthquakes up to 9.0 on the Richter scale, and their solution was the lattice-style trunk supported by three inclined slips, which ensure the building's steadiness and give an impression of lightness. 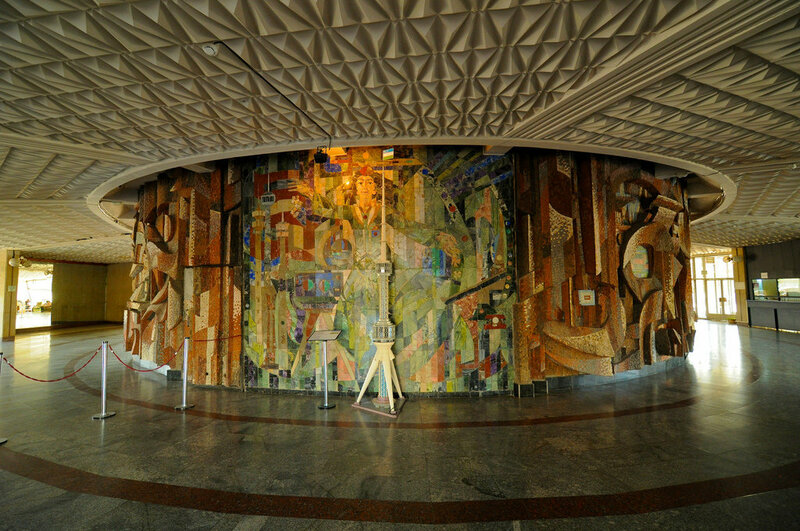 The tower’s foyer is decorated with mosaic panels of semi-precious stones, marble and metal. The tower is open to visitors daily from 10:00 - 17:00 - remember to bring your passport to enter. High speed lifts take you to the observation deck and there are also two restaurants. Now head back to your starting point - this time on the other, more residential, side of the canal.